A flash of blinding light— a shuddering crash— grim wreckage plummeting to Earth !! And then the screaming headlines— CAPTAIN ALBRIGHT IS DEAD !! But when America faced a diabolical new weapon out of Japan, it was Captain Midnight who came back from the grave — a raging figure of vengeance — to hurl the mighty fury of his Secret Squadron against… the INVISIBLE MENACE ! 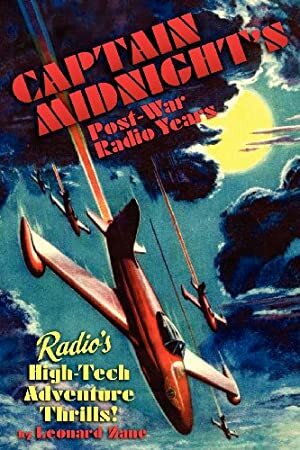 Captain Midnight was a radio serial that started in 1938. It was about an heroic adventuring pilot and inventor. 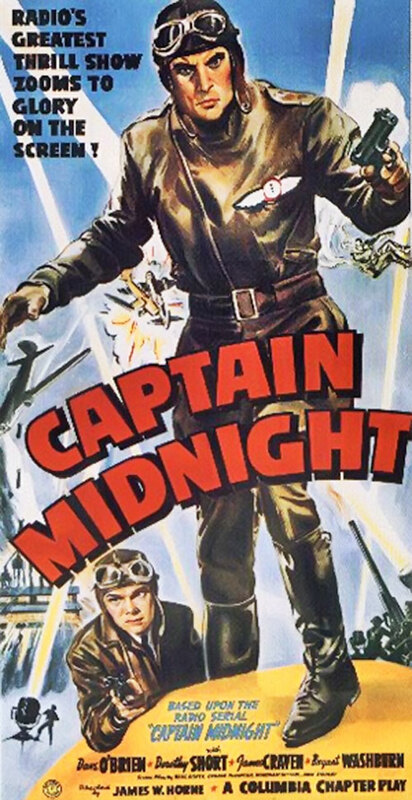 Captain Midnight became one of the big serials of the 1940s, and there were a number of spin-offs (including TV serials). This profile is primarily based on the Fawcett comic book adaptation of the 1940s. But do note that this entry is very old, and thus doesn’t follow the writeups.org formats that emerged later. Group Affiliation: Captain Midnight’s Secret Squadron. Base Of Operations: Nevada, but mobile. I gave him Vehicles of 10, not because I saw much evidence of extreme piloting skill, but instead because (1) Captain Midnight is known for being a pilot and (2) Captain Marvel says on the cover of Captain Midnight #1, “Meet Captain Midnight, greatest ace of them all !”, and Captain Marvel wouldn’t lie to me. For the Nighthawk’s stats, I mostly copied Blackhawk’s plane’s stats. His buddies consist of Chuck Ramsay, a kid who’s a decent pilot, mechanic, etc., Ichabod Mudd, a gangly awkward mechanic, and Joyce Ramsay, token female. These are the only members of the Secret Squadron that we know about, but if you get one of those Captain Midnight secret decoder rings, you too can be a member of his secret squadron and help him when need arises. I’ll quote from Captain Midnight #1. “Now you know the incredible truth ! ‘Meek’ Captain Albright is really CAPTAIN MIDNIGHT—grim champion of the American way of life ! With the world at peace, Captain Midnight vanished into the shadows ! But now , there is war and CAPTAIN MIDNIGHT IS BACK ! The ending gong of midnight… the roar of the airplane engine, at first in the distance… then stronger as it sounds in a dive… this was Captain Midnight ! 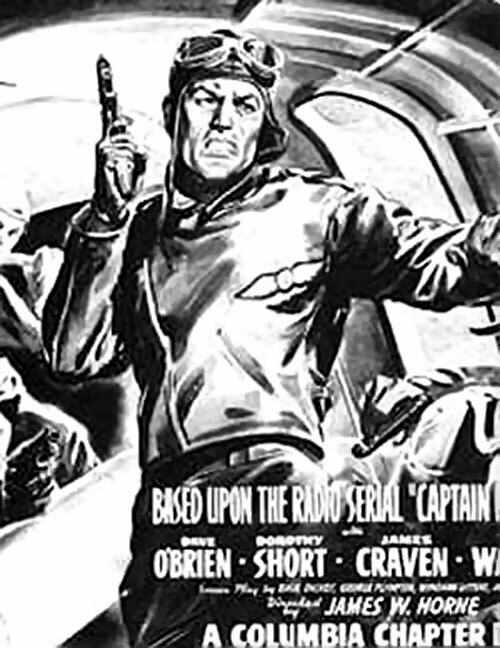 The Captain Midnight radio series had its beginnings in 1938 on Chicago radio station, WGN. Created by Robert M. Burtt and Willfred G. Moore, the creators of The Air Adventures of Jimmie Allen, the series was sponsored by the Skelly Oil Company. In the beginning, “Captain Midnight” was simply an undercover name for Jim “Red” Albright, who regularly piloted cargo and passengers. As an undercover agent, Albright was trying to gather information on a gang of criminals. However, by the end of the first run, ending in a summer hiatus, the Captain Midnight persona was beginning to stick. Many knew him only by that name. Captain Midnight was constantly trying to stop the plans of the evil Ivan Shark and his daughter Fury. Shark remained as Midnight’s evil nemesis throughout the length of the radio run. Captain Midnight was helped in his efforts by Chuck Ramsey and Patsy Donovan (later, Joyce Ryan) who were members of his Secret Squadron. In the national versions, there was also Ichabod Mudd, Midnight’s mechanic. There were a number of different actors playing the various roles over the long run. The series grew in popularity and was broadcast over the Mutual Network beginning in 1940 sponsored by Ovaltine. Captain Midnight was one of the early series to offer exciting premiums. Young listeners could also be a part of the Secret Squadron by signing up usually via the premiums and receiving decoder badges, etc. Despite the adult sponsor, Skelly advertised by telling the kids to get their dads to the gasoline stations to get the premiums and, of course, Skelly products. Ovaltine continued the premiums via their foil tops. Eventually, the series moved from radio to film and finally to television. Many know the character from the television run starring Richard Webb. If you have an opportunity to view some of the old television shows, note the actor playing Tut, the scientist for the Secret Squadron. This is the great radio actor Olan Soule (Mr. Firstnighter, One Man’s Family, and others). In Captain Midnight #1, his costume consists of a red jumpsuit (with those pants with the weird bulges on the sides), blue belt, blue boots, blue gloves, and a blue aviator’s hood with goggles. His chest symbol is a winged clock whose hands are both at 12. The clock is white, the wings are yellow. He wears at least two different costumes later on, as seen in Golden Age Greats #4, and another costume elsewhere (one which puts his chest symbol on his head) that I saw in an ad for Ovaltine. Friendly guy who is very serious about fighting the enemies of America. Technically, this character has never appeared in the DCU AFAIK. I don’t know if he made a cameo in The Golden Age. However, as a Fawcett character, one can easily stick him into the DCU. In which case he would be a member of the All-Star Squadron, but probably an inactive one. Note that he was involved with a long crossover with Spy Smasher. Buddy (Ichabod “Icky” Mudd), Buddy (Chuck Ramsay), Buddy (Joyce Ramsay; note: she is Joyce Ryan in the radio show), Sharp Eye. Captain Midnight’s Secret Squadron (High). The Doom Ray is a flashlight sized device that fires an invisible beam which burns into its target the shape of a clock with both hands at 12. This frightens most crooks since they know that Captain Midnight must be near. It is mostly used to burn this symbol into walls or occasionally a victim’s clothing. Captain Midnight once used it on someone’s jacket, while Chuck Ramsay used it on the seat of a crook’s pants. Glider-Chute [BODY 01, Gliding: 04, R#03]. The Glider-Chute is another one of Armstrong’s amazing inventions. It consists of flaps of cloth like a cape which attaches to the costume at the neck area and again at knee level, and allows him to glide long before a normal parachute would open]. Blackout Bombs [BODY 01, Darkness: 05]. “A spring reel inside his special belt clicks out yards of silken cord with the strength of steel wire.” This later changes to “a wire-strong plastic-fiber rope”. 3 AP ACD? Omni-Gadgets (x2). A switchblade knife hidden in the heel of his shoe. A radio compass that broadcasts its own location. Fireworks inside a briefcase that explode when the briefcase is opened. A spring-blade knife whose blade pops out the back of Cap’s belt. A tiny transmitter built into Cap’s belt. Another invention that I don’t consider an Omni-Gadget is his design of a radio-controlled bomber which falls under Scientist (Drawing Plans). Source of Character: Fawcett Comics (Character has also appeared in other media, especially radio).